OK – so here’s another on from the good people at Build Your Own Clone. 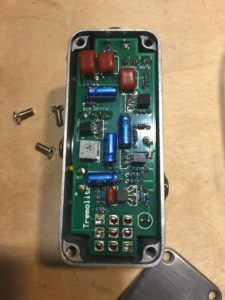 Previously, I had built the EA Australia Tremolo (see this post here), but since the current craze is the micro-pedal, I thought I’d give it a shot. Not much out of the ordinary with this one. Sounds great, easy to use, performs as expected. Low current draw, transistor based circuit with a tiny footprint. 2 controls, speed and depth, and an interior trimpot to control the output. The build was as expected. Excellent quality PCB, good components, but it is a very tight fit as the controls are off board. No room for battery, so this one only runs on external 9v DC. 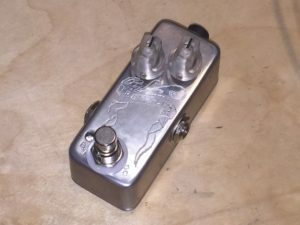 I wanted to do something different this one, so I polished the enclosure, added some knobs, and did some engraving to it with a Dremel tool. Turned out OK. In retrospect, I should’ve used a diamond burr instead of tungsten carbide, as it made my cuts really rough and was difficult to control. 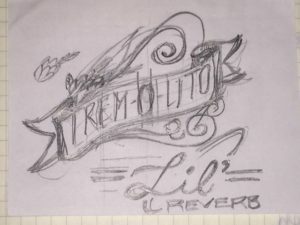 Started out with a pencil sketch to get my idea down. I then I coated the top of the enclosure with white goache, waited for it to dry, and sketched on the design with a pencil, then went to work on the Dremel tool. Here’s the final product. It sounds great, I’m happy with how the polishing turned out, and I learned a lot during the engraving process. Hope you like it.